Microfluidics technology could revolutionize point-of-care medicine by making it possible to fabricate cheap, disposable card-sized plastic 'microfluidic chips' capable of diagnosing a range of conditions on the spot from a drop of blood. A simple bonding technique could help to make this a reality. This technology has been under development for many years, but has been hampered by the difficult and expensive task of bonding the plastic parts of the chips in a way that preserves the integrity of the microchannels needed to achieve diagnostic functions. Now a bonding technique that overcomes many of the shortcomings of existing bonding methods has been developed by researchers from A*STAR's Singapore Institute of Manufacturing Technology (SIMTech) in collaboration with coworkers from Nanyang Technological University and Seoul National University of Science and Technology. "A key challenge in the commercialization of microfluidic devices is lowering the manufacturing cost," explains Gary Sum Huan Ng from the SIMTech team. "The bonding process to seal the microchannels is often the bottleneck in microfluidics manufacturing." 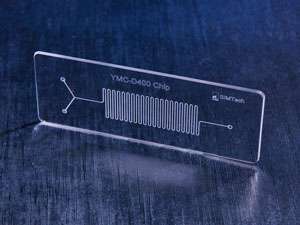 Microfluidic devices are essentially comprised of microchannels etched into plastic, which route a sample of biofluid to reservoirs of fluids or substrates that are active toward an analyte that may be present in the sample. Many methods are used to bond the various parts of a microfluidic device together, but most are slow and painstaking, hindering mass production. Ultrasonic welding, which applies high-frequency vibrations to create a solid-state weld, is promising for scaling up production because it's fast, produces a strong bond, and uses compact automated equipment. However, the quality of bonds produced by ultrasonic welding is difficult to control due to excess melting and the entrapment of air bubbles. The researchers have shown that sandwiching a composite film between the two plastic parts to be bonded is very effective in preventing air bubbles and melt flow during ultrasonic welding. The key was to incorporate thermoplastic microspheres in the composite film to help confine and control melting. "The thermoplastic microspheres, which are scattered within an elastomer matrix to form the composite film, act as micro energy directors that melt and collapse when the ultrasonic energy is applied to create the weld," says Ng. "The ultrasonic directors are restrained by the elastomeric matrix, which effectively prevents uncontrolled melt flow as well as the generation of trapped air bubbles. This method may overcome the critical bonding issue in the mass manufacturing of microfluidic devices." They've been talking about microfludic diagnostic chips for 10 years. Nothing has come of it. The pie-in-the-sky "cheap" diagnostics have yet to materialize.